Masaoka Shiki (Japanese: 正岡子規; pseudonym Masaoka Tsunenori) (September 17, 1867 – September 19, 1902) was a Japanese author, poet, critic, journalist, and essayist, founder of the Japanese literary magazine Hototogisu and patron to a number of young poets, who played a leading role in the revival of the traditional waka and haiku forms of Japanese poetry. During his short life he became a highly esteemed critic. His role as a charismatic literary figure has shadowed his merits as a poet and diarist. Initially a prose writer, Masaoka devoted a major portion of his short life to the collection and composition of haiku. Masaoka advocated a realistic, descriptive poetic style, which he regarded as the original spirit of Japanese verse. He explored the use of new subject matter and vocabulary in traditional waka and haiku forms, and introduced the concept of shasei (“delineation from nature” or “sketching”) to describe his use of realistic images and contemporary language. His writings greatly influenced the Japanese literary world as it struggled to define modern Japanese modes of expression. Bedridden by illness in his final years, he maintained an active literary career until his premature death of spinal tuberculosis. He is regarded as the last of the four great Japanese masters of brief verse. Masaoka was born September 17, 1867, into a samurai (warrior) family in Matsuyama, present-day Ehime Prefecture. In 1868 Japan launched into the Meiji Restoration, rapidly developing a modern culture strongly influenced by the West. Under the moonlight, cuckoo cried as if it coughed out blood. the cry reminded me of my old home town far away. (Because of its sad song, the Japanese cuckoo, hototogisu, (Shiki) is said to sing until it “coughs out blood.”) Young Masaoka composed his poem about the sad song of the cuckoo; later he chose (Shiki), hototogisu, for his pen name, and became consumptive and “coughed up blood.” During his life, Masaoka Shiki wrote around nine hundred Chinese poems. At the age of fifteen, Shiki began to compose tanka (poems with thirty-one syllables arranged 5-7-5-7-7); he composed about 2300 tanka in his life. At the age of eighteen, Masaoka became interested in traditional haiku (short poems with fifteen syllables), written on portraits. Shiki enjoyed drawing, and early in his childhood he discovered the similarity between literature and visual depiction in art. His keen sense of artistic observation augmented his appreciation for the haiku on portraits. Later in his life, drawing flowers and objects around him became a consolation for being bedridden. As a college student in Tokyo, Masaoka sometimes enjoyed word games with his friends. He also liked baseball very much, and is said to have introduced baseball to Matsuyama. He helped promote baseball in Japan by creating Japanese translations for baseball terminology (these were quickly abandoned in favor of anglicized terms). The kanji (Japanese character) for baseball literally means field ball and 'field ball' can be translated into no boru ("no" - field; "boru" - ball) in Japanese. In his infancy, Masaoka had been called Noboru by his friends and family. Masaoka believed that wordplay was what made literature witty and interesting. He once composed a haiku on a green herb rice cake, made of rice pounded in a mortar with steamed leaves of mugworts. In 1883, Masaoka went to Tokyo, where he attended University Preparatory College and then studied classic Japanese literature at the Tokyo Imperial University. He began to write poetry seriously in 1885. During this period he traveled around Japan and met Natsume Soseki (1867-1916), who later gained fame as a novelist and short story writer, and Akiyama Saneyuki. When he was twenty-two, Masaoka began to suffer from tuberculosis. He changed his name to Shiki, another name for the Japanese cuckoo (hototogisu). From that time on, he was inspired by his uncle, the haiku teacher Ohara Kiju, and began to devote himself to haiku. 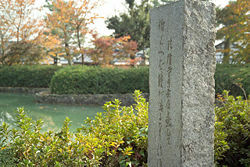 Shiki composed over 25,500 haiku in his short life. After Ohara Kiju passed away, Masaoka began to classify old haiku according to seasonal words. At that time there were several ways of using seasonal words, and they were used differently according to writers. For example, there were many kinds of 'tofu,' such as cold tofu and yu-dofu (tofu simmered in hot water). Masaoka began to consider what season each word represented. Masaoka's studies were shortened because of his health problems. After studying at Tokyo Imperial University from 1890 to 1892, he withdrew and joined the newspaper Nippon as a haiku editor, and began his reform of the Japanese poetic form. Shiki devoted the rest of his life to the writing of haiku and waka (or tanka). During his brief service with the Japanese army as a correspondent during the Sino-Japanese War, the tuberculosis he had first contracted in 1889 became worse, and from that time on he was almost constantly an invalid. Masaoka also suffered from caries of the spine, but he faced his illness and physical pain with dignity and ironic humor. In spite of ill health, Shiki maintained a prominent position in the literary world, and his views on poetry and aesthetics, as well as his own poems, appeared regularly in print. Masaoka frequently mentioned his illness in his poems and in such essays as “Byosho rokushaku” (1902; “The Six-foot Sickbed”), but maintained an emotional detachment from his physical suffering. During the last years of his life, Masaoka was a bed-ridden invalid, but his home became a meeting place for his friends and followers, who gathered there to discuss literature. Masaoka Shiki died in Tokyo on September 9, 1902, a few weeks before his thirty-fifth birthday. Masaoka claimed that traditional forms of Japanese poetry should be modernized, and coined the terms "haiku" (replacing "hokku") and "tanka" (replacing "waka"). He is often called the founder of the realistic group, 写生派, because he championed the use of realism in haiku. His contribution as a critic was the rediscovery of Man'yōshū and re-evaluation of Minamoto no Sanetomo, the third shogun of the Kamakura Shogunate, as well as the rehabilitation of the haiku of Yosa Buson. Haiku, a traditional Japanese unrhymed poetic form, consists of seventeen syllables arranged in three lines containing five, seven, and five syllables, respectively. Outstanding haiku masters were Matsuo Bashõ (1644-1694), Yosa Buson (1716-1783), and Kobayashi Issa (1763-1827). Haiku's emphasis on the immediate and concrete influenced the Imaginism of the early twentieth century in Europe and America, especially through the efforts of Ezra Pound. Masaoka and his successor Takahama Kyoshi (1874-1959) saw haiku as a poetry of a single object. Tanka is a Japanese fixed form of verse of thirty-one syllables and five lines, the first and third of which have five syllables, and the other seven (5-7-5-7-7). Tanka focuses on the essence of one static event, image, or mood. Until the sixteenth century, near all poetry written in Japanese took the tanka form. As early as 1892, Masaoka began to feel that Japanese poetry needed to be liberated from ancient rules which dictated the subject matter and vocabulary in order for it to remain a viable form of artistic expression. At that time, the traditional seventeen-syllable verse form was considered incapable of expressing the complexities of modern life. After discovering Western philosophy, Shiki became convinced that laconic descriptions were an effective means of literary expression. In an essay entitled “Jojibun” (“Narration”), which appeared in the newspaper Nihon in 1900, Masaoka introduced the word shasei (“delineation from nature” or “sketching”) to describe his methodology of using contemporary language and realistic images. His own haiku were characterized by visual description and a concise style. Masaoka himself took up the practice of going out into nature with notebooks and making poetic "sketches," thus deviating from the traditional subject matter of haiku. In 1897, he and his disciples founded the literary journal Hototogisu. Next year he turned his attention to tanka in Letters to the Tanka Poets. Masaoka’s articles inspired a revival of interest in the eighth-century poetry anthology Man'yo-shu (“Collection of Ten Thousand Leaves”) and in the haiku poet Yosa Buson. He believed that Buson’s haiku, which had received little recognition, were technically refined and gave clear and vivid impressions to the reader. He published several essays in the newspaper Nihon, including "Basho Zatsudan" (Miscellanies about Basho), criticizing Matsuo Bashō’s famous “hokkus” for their lack of poetic purity and for having explanatory prosaic elements; later he softened his stance. Masaoka wrote a theoretical text on how to improve haiku, 'Haiku Taiyo', The Element of Haiku. Through Masaoka's work, haiku, which was considered as a low-ranking form of poetry composed in bars frequented by barbers and rikisha-men, regained the prestige it had enjoyed during the Tokugawa period in the seventeenth century. and look like a monkey". The poem received mixed reviews; the famous poet Saito Mokichi praised it but Takahama Kyoshi ignored it all his life. The poem begins with an external visual depiction and progresses to an internalized one. Cockscomb flowers are an ardent red; the large number suggests their power of survival. Once, on his way to Tokyo, he stopped at Nara, and composed his best-known haiku. This page was last modified on 31 August 2018, at 14:42.